Add a fun and unique touch to your reception decorations with these foil cocktail napkins. 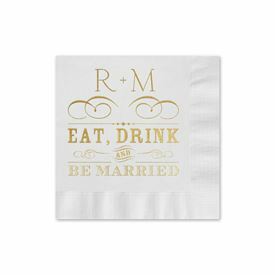 "Eat, Drink and Be Married" is stylishly presented in a trendy typography format with your initials completing the design. Design and wording are printed in your choice of foil color. Personalization Options: Choose from six napkin colors. Design and wording are printed in your choice of foil color. "Eat, Drink and Be Married" is printed in the font shown. Your initials are printed in your choice font.